Volume I of the masterful Cairo Trilogy. 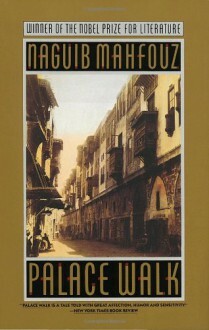 A national best-seller in both hardcover and paperback, it introduces the engrossing saga of a Muslim family in Cairo during Egypt's occupation by British forces in the early 1900s. Bad writing? Bad translation? Both? This is a poignant story of the lives of a religious Muslim family in the Cairo of the British occupation in the early 20th century. It took me a few chapters to get attached to the characters, but then I was hooked and will want to read the rest of the trilogy.